The Lake Mary asphalt contractor of choice is All County Paving. The hot and humid temperatures can be overwhelming to people, but it can also be overwhelming for asphalt. Property and homeowners know that with the extreme heat asphalt surfaces become damaged and a quality Lake Mary asphalt paving contractor is essential. Property owners and homeowners contact All County Paving as their professional paving contractor because All County Paving has over three decades of experience and knowledge in the asphalt industry. We are the asphalt paving contractor that Lake Mary, Florida homeowners, and property owners can truly trust. With each paving service comes quality, dedication and a personal care that each customer desires. All County Paving has an asphalt paving service that you can rely upon. We are fully insured, licensed, and bonded, so our customers are fully protected. Lake Mary, Florida is a small suburban city with a population of 13,822. Lake Mary was ranked by Money magazine as the #4 Best Place to Live in America. Lake Mary is eighteen miles from Orlando. Visitors coming to Lake Mary can stop by the Lake Mary Museum to learn about the history of this small city. The museum has a variety of artifacts, photos, and other exhibits that are related to the city. Central Park in Lake Mary is one of the highlights of the city. Central Park is located on the City Hall grounds and there is a reflecting pond, a gazebo, and beauty. You can bring the family out and have a picnic here and enjoy the peace and tranquility that the park provides. The Lake Mary Cemetery may not be on your list of things to do in Lake Mary, but there is plenty of history here. The cemetery was established in 1894 and is a located in downtown Lake Mary. There are two acres of history awaiting you here. Visitors who want a taste of Lake Mary can visit the Farmer’s Market located downtown. The Farmer’s Market starts in May and runs through the end of October. Here you can taste homemade pies, cakes, jams, and other tasty treats along with locally grown fruits and vegetables. While you are downtown, consider taking a stroll along Main Street and you will discover an array of boutiques, diners, and art galleries where you can do shopping and grab a bite to eat. Lake Mary, Florida is a small community that is very welcoming. Spend the weekend in Lake Mary, Florida and enjoy something unique. All County Florida is the asphalt paving contractor that residents and property owners call for all their asphalt needs. If you need any asphalt work done, then give All County Paving a call today! At All County Paving, we are proud to be a top paving contractor serving Lake Mary, Florida and its residents. We have continuously made professionalism, craftsmanship, and customer service our main priorities. Our team recently received an online request from a customer we had worked with many times before. 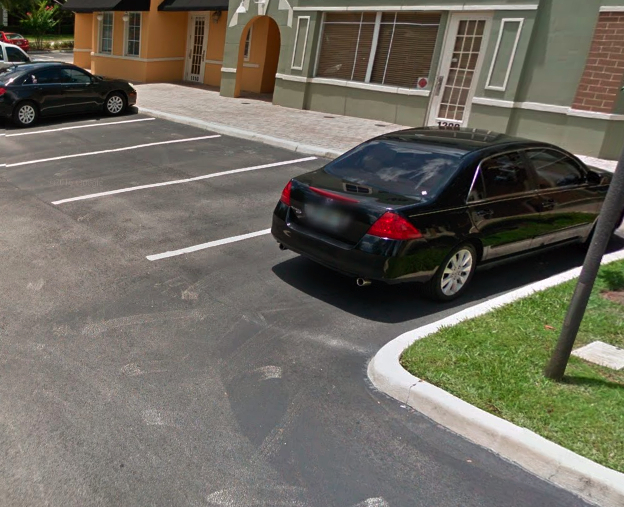 The property manager contacting us was looking for asphalt repair in Lake Mary. A number of small potholes had begun to form in the parking lot. The manager explained that it had been a number of years since their last parking lot maintenance work had been done. 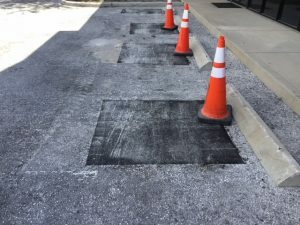 We assured him that we could handle the parking lot repair work efficiently and effectively. We sent a crew to evaluate the asphalt parking lot later that week. We determined that pothole patching would be necessary. The asphalt surface had also begun to fade and was quite brittle. 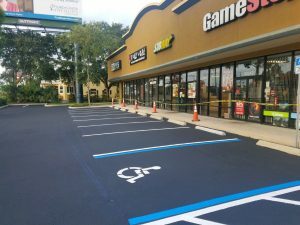 We agreed to sealcoat the parking lot and restripe it after the asphalt repair work was complete. The client was very happy to know that one asphalt company could handle all of his parking lot paving needs. By the time we had completed the parking lot repair project, we were able to sealcoat the asphalt and restripe it to the desires of the property manager. The parking lot looked nearly new by the time we had finished our final asphalt maintenance. The client was very pleased with our work and the schedule and pricing that was involved with the asphalt repair.